Left to raise his daughter alone, new dad Richard Johnson can teach most people a thing or two about being a doting parent. 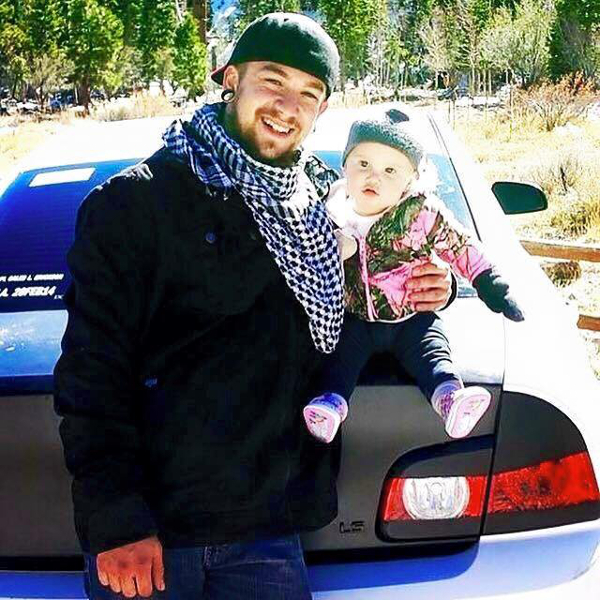 The Las Vegas father, 21, has come a long way since being left with his daughter Persephone after her mother disappeared a month after she was born. Confident and happy, Richard is proving to be an inspiration to many with his story of strength. Stumbling across an online community for fathers, he posted a raw and honest message that has since gone viral, with more than 92,000 likes and thousands of comments, most offering messages of support. “Her mother left about a month after she was born. We still don’t know exactly why, but we suspect postpartum depression played a part. I was so nervous and scared about being a father in general, but now I was a single father and had to fulfil two roles. I wasn’t sure I could do it,” he writes. Watching the Life of Dad Facebook page closely, Richard saw that there were other fathers out there who were in similar predicament. “The page started to turn into a major confidence booster and really helped me through all of this,” Richard says. He says submissions from other dads “truly helped my daughter and me through a very difficult time”. Persephone is now 10 months old and the proud dad says they are both happy and continue to grow together. “I come from a family of divorce and was raised by a single mother. When my father left when I was six, I didn’t know I wouldn’t see or hear from him again until I was 21. So being that I never had a father, it was truly frightening to become one. Even more so when I was going to do it alone,” Richard says. Despite the happy ending, Richard admits the days have been rough and “at times I wasn’t sure I could make it another day”. “I spent more than a few nights holding my little girl as she slept, weeping because I wasn’t sure I was going to be a good enough father for her. One night…she came to me and laid her tiny little hand on my cheek and stared into my eyes. I took it as ‘Come on Daddy, we have a lot to do’,” he says. And he is full of sage advice for single parents who feel like they are not good enough: “Look into your amazing child’s eyes and just tell them you love them. You’d be amazed to see how much strength you have when someone else is counting on you and loving you more and more for what you’re doing. You’ll find strength where you thought you had none”. For information and support contact Parentline, Beyond Blue or PANDA.